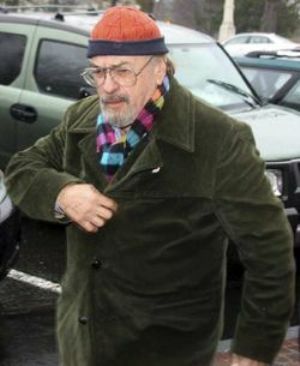 Actor Rip Torn was in a Connecticut courtroom this morning where he pled not guilty to several charges stemming from his gun-wielding, bank-breaking-into drunken night this past January in Salisbury, Conn. In case you forgot, Rip Torn was found passed out inside a bank with a loaded gun; at the time he told police he thought it was his house. He was charged with carrying a gun without a permit, carrying a gun while intoxicated, criminal trespass, criminal mischief, and burglary. According to police, Rip Torn took off his boots and hat and placed them by the door before entering the bank; a window had been broken. Today’s judge said Torn may remain out on bail as long as he stays away from alcohol. The actor, who just finished rehab, told the judge he has never missed a day of work. I’m not too sure what that has to do with anything, he still broke into a friggin’ bank with a loaded weapon while he was wasted. Allegedly. Rip Torn has struggled with alcohol addiction for years, and after making bail, entered February 2nd; he has since transferred to an outpatient program. With his next court appearance set for April 27th, Torn will remain free on $100,000 bond. previous post: Heidi Montag and Spencer Pratt Are Breaking Up. Allegedly. 50 queries in 0.934 seconds.